Bike Parking and Bike Storage Solutions for Multi-Family Apartment and Condominium Communities Offer Appealing, In-Demand Tenant Amenities. Add convenient bike parking and secure bike storage to your list of amenities for multi-family and apartment properties to attract and retain tenants. Bicycle parking and storage solutions are increasingly in demand as municipal planning departments make city and towns bicycle friendly and Millennials and urban dwellers shift to bicycle and multi-mode transportation options. CycleSafe bike lockers, bike racks, bike shelters, bike rooms and other bicycle parking infrastructure offer both Class I long-term and Class II short-term bicycle parking solutions for multi-family and apartment properties. With urban square footage costs at a premium, CycleSafe bike parking and storage solutions incorporate space-saving designs for cost-efficient space utilization, including our vertical Bike Wall Racks, WallRack Frames, WallRack Stands, two-tier Quad Hi-Density Bike Racks, and more. We work with multi-family housing and apartment building developers, architects, building owners, property managers, and others to optimize bike parking and storage on their properties. 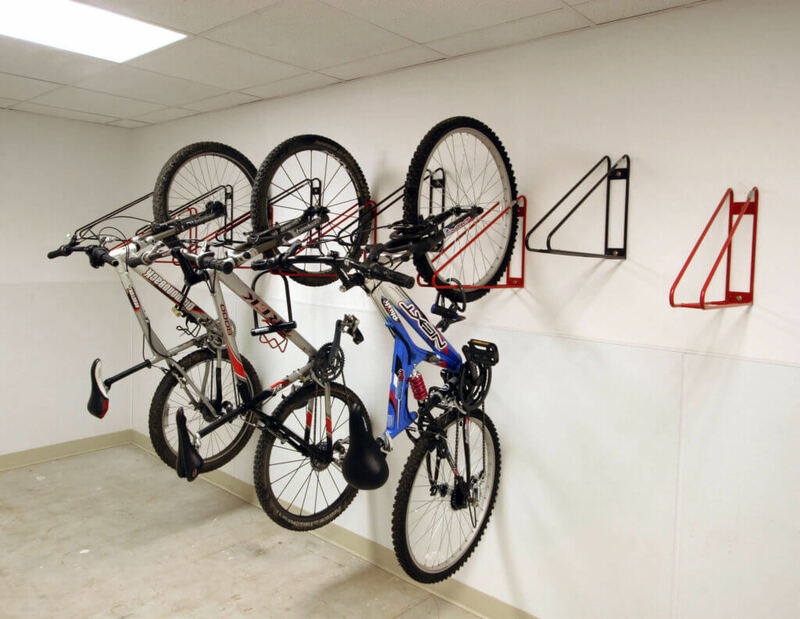 CycleSafe vertical and two-tier bike wall racks and stands are ideal long-term space-saving parking options for bike parking security, stability, and safety for multi-family housing and apartment building bike rooms. We offer a wide range of both long-term and short-term, indoor and outdoor bike racks to compliment your properties and meet your tenants’ convenience and security needs. We select product materials for long-lasting durability, designed for use over decades, not years, including stainless steel and leading-edge coating technology for maximum corrosion and impact resistance, and protection of bike finishes. CycleSafe Bicycle Lockers provide Class I long-term parking and the highest security bike storage solution for multi-family housing and apartment building communities with protection from theft, vandalism, and inclement weather. Durable and virtually indestructible, our bike lockers are compression molded with modern structural-grade composite materials which are non-corrosive, rust free, impact resistant, and with a graffiti/UV resistant polyurethane enamel paint finish. Install them on your multi-family and apartment building properties for the proven, lowest cost of ownership over long-term use, with a life span measured in decades, not years. Bike shelters provide added security and covered protection from the elements for the convenience of multi-family housing and apartment building tenants, combining with our bike racks to meet on-demand, Class 2 bicycle parking for four to ten bike per unit. Compression-molded tops are contoured for runoff and support frames consist of heavy gauge steel tubing protected with polyester powder coat finishes. Add Plexiglas, wire mesh, or perforated metal side panels for additional protection from the elements. Below are just a few of the property management, engineering, architectural, and construction firms with whom we worked to provide bike parking solutions for multi-family and other commercial and residential properties.